Darlene Virginia Cushing (February 6, 2008) | Burmeister-Johannsen Funeral Home, Inc.
Darlene Virginia Cushing, the daughter of Clyde A. and Stella M. (Wilson) Eckel, was born on March 17, 1919, on the family farm located three miles west of Shelby, Iowa. She started school in Tennant, Iowa, and then attended Shelby schools. Darlene was a good student and graduated from high school in 1936. On September 16, 1939, Darlene married Clarence “Short” Charles Cushing in Council Bluffs, Iowa. The couple made their home in Shelby, where they have enjoyed the privilege of living in the same house since 1942. For four years, Darlene worked at the Haskel Meat Locker in Shelby. Darlene was an active member of the United Lutheran Church in Shelby, where she had served as a Sunday school teacher and had held various offices within the Church Ladies group. She was a good cook who was known for her delicious jams, jellies, and cucumber “stickles”. She was a frugal and hardworking homemaker who sold high quality black walnut meats and raspberries. Darlene was dedicated to living by the Golden Rule. Darlene V. Cushing died on Wednesday, February 6, 2008, at Myrtue Medical Center in Harlan, Iowa, at the age of 88 years, 10 months, and 20 days. Darlene was preceded in death by her parents and two infant sisters. 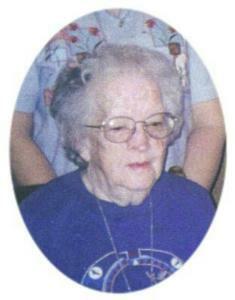 She is survived by her husband of 68 years, Clarence “Short” Cushing of Shelby, Iowa; one son, Barry (Carol) Cushing of Meridian, Idaho; one daughter, Judy (George) Huckins of Kansas City, Missouri; one sister, Dorothy (Lewis) Muzzy of Spring Valley, California; six grandchildren; 14 great-grandchildren; and one great-great-grandchild; and other relatives and friends. Funeral services were held on Saturday, February 9, 2008, at the United Lutheran Church in Shelby, Iowa, with Pastor Duane Anunson officiating. Nancy Armstrong served as the organist, and Lee McKnabb was the vocalist. Casket bearers were Christi Carter, Scott Huckins, Troy Huckins, Karen Hibbs, Andrew Cushing, and Clayton Cushing. Burial was in the Shelby Cemetery in Shelby, Iowa. Memorials may be directed to the United Lutheran Church. The Burmeister-Johannsen Funeral Home in Shelby was in charge of the arrangements.